I knew I would screw this show up, I really did. I promise I’ll never come back. So, after an almighty faux-pas in the final furlong, is there anything much to say about the actual winners? Mostly, they illustrate the wrestling match between the salve of political/social conscience and self-congratulation I was droning on about in my predictions piece, something Harvey Scissorhands also recognised when it came to discussing how Shakespeare in Love trumped Saving Private Ryan (besides the former being the better film, that is); Hollywood can – usually – be relied upon to upvote their own artistic validation. But not this year. 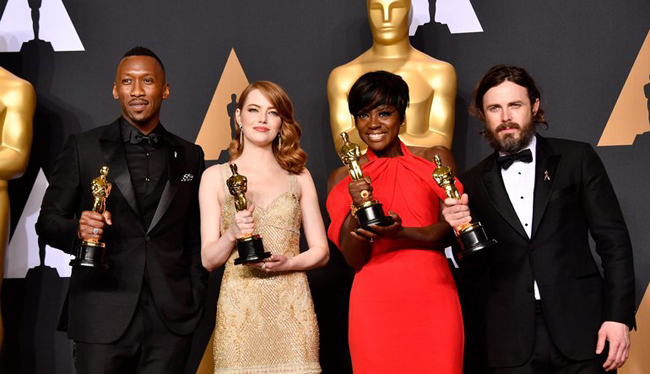 La La Land had to make do with the most wins (six), in an evening when the Academy was otherwise choosing to emphasise how alert and awake to serious matters it was, such is its tumult over Trumpton. Never let it be said they’re content to sit back and fiddle while their cosy idyll burns. Why, they recognised African Americans several times (Best Picture, Supporting Actress, Supporting Actor, Adapted Screenplay), so they can forget about having been made to feel guilty again for at least a couple more years (Phew!) They recognised crises abroad (Best Documentary Short) and at home (Best Documentary Feature) and protested the Presidential travel ban (Best Foreign Language Film). And, just to show they’re forgiving, in the Polanski/Allen move of the evening, they gave Mel’s movie two technical statuettes. Boy, will they all have slept soundly last night! Jimmy Kimmel? He seems to have gone down okay, coasting on his late-night talk show routine. Since he bigged up Letterman’s berated Oscars turn a few days back, Im reluctant to be too hard on him. As for my all-important track record: 14 out of 24, so I’m maintaining my rigorously mediocre standards. Did the best picture win? Does it ever? I’ll wisely reserve judgement until I’ve caught the lot, but right now, Manchester by the Sea leads out of the five I’ve seen, and that’s even with me not much liking Casey Affleck. Moonlight’s win, besides the gnawing feeling among voters that they should possibly, maybe, be seen to stand for something, may also be a symptom of an increasingly prevalent condition, as blanket coverage becomes ever more suffocating and fatigue with the hot favourite sets in. The old backlash problem. One might see that in Spotlight’s prize last year. Oscar, being the last and most prestigious of the awards ceremonies, is also damned by being the resultantly least surprising, oft times. That’s what they need mix-ups to spice things up. Of course, Moonlight could also simply just be the Best Picture. So Chazelle, like his characters, got the big success he strived for. But at what price, Damien? There’s no doubt Affleck’s performance in Manchester by the Sea is Oscar-worthy; I can say that as one who has never been particularly won over by the guy. Although, I do greatly admire his beard. Not as top drawer as Dev Patel’s but something to be proud of nonetheless. Affleck had been the one to bet on, of course, before Denzel’s SAG win. Casey’s skeletons in the closet failed to dent his chances, so he can probably look forward to them resurfacing again in a few years, more resoundingly. Then he’ll fall from grace, then be redeemed by voters once more. She also won Best Picture. I suspect Ali wouldn’t have bagged it if he’d been up against Sunny Pawar rather than Dev Patel, but Moonlight’s trio of statuettes puts in good company with last year’s victor (an even more modest two). The most predictable win of the evening? I don’t think anyone had even a glimmer of a doubt on this one. Another that was mostly probable. The win highlights that Hidden Figures left the awards empty-handed, which like Lion, was looking not unlikely. Is this that Titanic thing, slightly, of the emotional ride disguising that the actual writing isn’t that amazing? Not that I want to denigrate La La Land by comparing it to Titanic, although I just did. I rooted for Lonergan on this, and for someone who languished in limbo for about a decade, it must be extra gratifying to have a comeback so well received. A shame Kubo and the Two Strings didn’t get any joy on the night, but Zootopia’s a great movie. 100% on Rotten Tomatoes can’t be wrong. A second Best Foreign Language Film Oscar for Farhadi. Yeah, it looked jolly nice. I preferred Arrival, mind. Empire wuz right. Always bet on Atwood. A deserved win about neutral, unarmed volunteers, or a PR piece in support of a group with ties to terrorism? Mel truly comes in from the cold. Hopefully he didn’t have a drink to celebrate. I mean, what? I guess it takes a true artiste to design intentionally bad-looking hair and make-up. Yeah, tis a good wee ditty. Well done, Pixar! You were desperately short of Best Animated Short Oscars, after all. No relation to the animation. Nice for Arrival to win something. Mel! Even more indirectly loved!